Chani introduced me to this recipe (i.e. this is not my recipe). 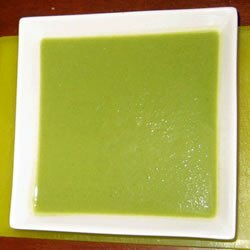 I HATE broccoli, but loved this soup. I ate every drop. It’s simple and good! The recipe is posted on AllRecipes, where people have submitted some interesting feedback. In fact, the image below is credited to Kathieddies of AllRecipes. Heat olive oil in a large saucepan, and saute onion and garlic until tender. Mix in broccoli, potato, and chicken broth. Bring to a boil, reduce heat, and simmer 15 minutes, until vegetables are tender. With a hand mixer or in a blender (I use a Braun hand blender ), puree the mixture until smooth. Return to the saucepan, and reheat. Season with nutmeg, salt, and pepper. posted by Lon	at 10:16 PM	Filed under Miscellaneous. You can follow any responses to this entry through the RSS 2.0 feed. Both comments and pings are currently closed. Espero gostar da sopa como gosto do brocolos cozido.